Ronny Deila is an engaging character who's done well in the bread and butter of Scottish football, but it's jam that Celtic crave and Europe is the only place where it's on offer. In his relationship with the supporters, Deila flits between two vastly contrasting worlds - a world of doubts and boos in Europe running parallel with a life of success and optimism in other competitions at home. No bridge has been built between these two existences. You can't look at what Celtic have done in the Europa League this season and conclude that Deila is beginning to get an angle on things in that environment, as Gordon Strachan and Neil Lennon did in their second season as Celtic manager. Strachan motored in year two in Europe, taking Celtic to the last 16 of the Champions League. Lennon didn't get anywhere close to that level in his second season but at least in the performances of his team in the Europa League in 2011 there were discernible signs of improvement. Those signs don't exist for Deila's Celtic. Admittedly, Lennon's team beat Rennes 3-1 at Parkhead and drew 1-1 away. Rennes finished sixth in the French league that season. They weren't bad. Celtic drew 1-1 with Udinese, home and away. Udinese went on to finish third in Serie A. They were useful. The best side that Celtic faced that season was the Atletico Madrid of Thibaut Courtois, Diego Godin, Felipe Luis, Mario Suarez, Arda Turan, Koke and Juanfran with Radamel Falcao appearing off the bench. They lost 2-0 away but 1-0 at home against a side that would go on and win the competition by beating Athletic Bilbao 3-0 in the final. There is a narrative, among some Celtic fans, that Lennon showed no sign of getting it together in Europe until his third season when they beat Barcelona and qualified for the last 16 of the Champions League. This is held up in support of Deila being given more time to make an impression on the bigger stage, but it's a flawed argument based on a misreading of the signs in Lennon's second European campaign. It's almost certainly too late for Deila to rescue a grim situation in his team's Europa League group, but he has two games in which to provide a shred of evidence that he can get it right next time - if there is to be a next time. Think of it as two opportunities to show majority shareholder Dermot Desmond and chief executive Peter Lawwell that he warrants another shot at Europe next season. His case is looking pretty flimsy right now. The first of those chances is against Ajax in Glasgow on Thursday. It's a match in which the failures of Molde, who beat Celtic home and away, need to be purged. A repeat of the defensive tomfoolery, mental frailty and tactical confusion that saw Celtic routed 5-2, over both ties, by the sixth best team in Norway and Deila will know again what it is like to be booed up the tunnel by his own fans. Right now, there is hardly a single result in Europe this season that Deila could point to that suggests his team is learning and getting better. The draw in Amsterdam was admirable, for sure. The draw against Fenerbahce at Celtic Park was far from a failure. The fact that Celtic led 1-0 and 2-1 in the Netherlands and 2-0 against the Turkish side in Glasgow is more of a problem. It was history repeating, Last season, Celtic lost leads in Europe and it cost them. And they're still doing it. Throw the Molde failures in on top of that and you have a significant case for the prosecution. There's an air of denial in certain quarters of Celtic. Molde manager Ole Gunnar Solskjaer would have been entitled to scoff had he seen John Collins' comments in the aftermath. 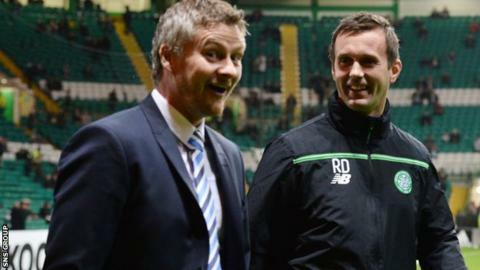 "Against Molde we were the better team in the two games," said Celtic assistant manager Collins. "They defended, sat behind the ball, weren't bothered about any kind of possession, even at home. They get away with the way they play, sitting back, but we don't want to play like that." Yes, poor Molde, having to make do with two victories, five goals and 21 attempts on Celtic's goal over both matches not to mention their thumping win over Fenerbahce in the opening round, the kind of result that Deila's Celtic always talk about achieving but never do. There are 48 teams in this Europa League and only four of them have out-scored Molde. They have 10 points from four games and have qualified for the knockouts with two matches to spare, but their style is "not something that excites me," said Collins. That's quite a comment from the assistant manager of a club that's sitting bottom of the group without a single win to its name. A victory over Ajax and Deila can press the pause button on those conversations that have become damning of his record in Europe. Another defeat and the sense of rewind increases. As does the board's temptation to hit eject. David Moyes has come on the market and Roy Keane, assistant manager with Republic of Ireland, has made it known he hopes to get back into club management after Euro 2016. Desmond was sweet on Keane for Celtic pre-Deila. The Norwegian may not be able to save his team but a win against Ajax would be no harm when it comes to the business of saving himself. Martin O'Neill's Republic of Ireland will never be accused of being football's equivalent of the Harlem Globetrotters, but there was a joyousness about what they achieved on Monday night in Dublin. In Scotland, the navel-gazing continues about the state of the game. Some argue that qualification for Euro 2016 would have done nothing to address the real problems, that a place in France would only have papered over the cracks. The Football Association of Ireland reckon that making the Euros after their play-off win against Bosnia-Herzegovina could bring as much as £10m into football in the Republic. You can do a lot of grassroots development with £10m. It's not just the kudos that Scotland missed out on, it's the much-needed cash. Tennis is a simple and beautiful game. It's just the administrators who make it unfathomable sometimes. As we lurch from one sporting scandal to another, the case of the Serbian player, David Savic, is worth thinking about. It's a relative dot on the landscape of sporting fraud, but it has its place in the pantheon of the bewildering all the same. Four years ago, Savic was banned from tennis for life after being found guilty of attempting to match-fix. On Thursday, Savic had his ban adjusted on appeal. The Serbian's life-ban from playing remains in place but as of March next year he will be allowed to act as a coach and attend tournaments. The twisted logic of this is bizarre. Savic, 30, is not trusted to play but is deemed suitable to help somebody else to play. The decision to relax the ban was taken in consideration of his "substantial assistance" to the Tennis Integrity Unit's player education programme - "in which he has appeared in a film to warn other players against involvement in betting-related corruption". Very few people outside of tennis have heard of Savic. In the grand scheme of things, he doesn't matter. In the sporting cesspool, there are bigger fish to fry. His reprieve, of sorts, is grim all the same.